2014’s Assassin’s Creed: Rogue isn’t a bad game, but it is a totally unnecessary one. The game feels like an afterthought to Unity, which was released in the same year. I wish more was done with Rogue because it may have one of the most intriguing plots of the series. You play as Shay, an assassin who no longer believes in the creed and changes allegiances to the templars. The game does a great job communicating Shay’s struggles and the reasons for his actions. Playing as the traditional “bad guys” in this game allows Rogue to expand the lore in new ways. However, the ending doesn’t amount to much and the connection it has to Unity feels entirely forced. The mechanics in Rogue feel unrefined and the world feels empty. It borrows locations and mechanics from III and IV yet doesn’t add its own twist to the series gameplay. Despite coming out annually, each Assassin’s Creed usually tries to add some new mechanic or switch up the gameplay in someway, but Rogue seems to feel its story is enough. Ultimately I feel Rogue would have been better served being a comic or novel because as a game it feels uninspired and redundant. Play III or IV instead of Rogue. Assassin’s Creed, the game that birthed a franchise, came out in 2007. At the time of release the game helped show what was possible on the Xbox 360 and PS3. The plot was tight and well told and the gameplay felt like a refreshing take on action and stealth. The setting of the Holy Land during the Crusades may be my favorite of the series and one that is underutilized in games overall. However, Assassin’s Creed is very much a first game in a series that has evolved. Going back to AC after playing its sequels is difficult. The series has progressed and playing as Altaïr now feels slow and clumsy. The movement and combat are very basic and the cities feel much smaller than in later entries. The game lacks much of the charm of later games and most of the characters are stone-faced and uninteresting. The game laid the foundation for the series and the subsequent games have built on that in a way that makes the first game feel narrow in scope and lacking in execution. Revelations is the final act of the storyline from II and Brotherhood. The player controls Ezio, the hero of the previous two games, who is now an aged master Assassin on his final mission. Storywise Ezio is laid out to pasture in a way that felt true to the character. Assassin’s Creed, for the most part, is a series full of vignettes of the character’s lives, but for Ezio the player had truly gotten to known him playing as him from birth to old age. It was satisfying seeing Ezio retire on top of his game. The gameplay continued the excellent tradition of II and Brotherhood. The hookblade and bombs were nice and addition. The main failure of the game is the virtual city of Istanbul. A victim of the past two game’s wide open and beautiful Italian cities, the game’s Istanbul was segmented and split up by loading screens. It made the whole thing feel very small and for a game about freedom of movement, feeling small is a very bad thing. On top of that the game experimented with first-person puzzles in the modern day part of the game. These were awkward and didn’t work. Revelations’s plot and gameplay are top notch, but it makes me sad that Ubisoft wasted the great city of Istanbul the way they did. Note: I played Unity after it was patched so many of the complaints others have about its bugs I did not experience so I will not be including them in this discussion. Unity was a big change for the series. It left behind the North American continent after the two previous games were set there and restricted the action to a single city. But what a city that was, Paris in Unity is beautifully crafted. Paris feels huge as the city is teeming with people and quests. Climbing Notre-Dame de Paris is one of the standout Assassin’s Creed experiences. The detail put into Paris’s well-known landmarks is a highlight and I was constantly stopping just to look at the architecture. The people of Paris are also a treat: Ubisoft used the power of the Xbox One and PS4 to exponentially increase the size and intelligence of its NPC crowds. They are now a part of the game that can help or hinder the player. Pairs, although great, has a few missteps:there are so many activities that the minimap feels crowded and it can be hard to find what you want. Sailing is absent, which after being such a key component of the last game is a bummer. Overall the shift back to Europe is a welcome one, but has a few bumps along the way. The best addition from Unity to the series is the Freerun Down button. In past games getting down from buildings was always a bit awkward, you either slowly climbed down by grabbing onto a ledge and dropping or jumped off into the street. Now getting off a building looks and feels as good as scaling one does. Arno keeps his speed while moving downward safely and the new animations look great. It’s a control change that the series has needed for a while. Many of the buildings are enterable in Paris, a first for the series, and this enables all sorts of new ways to assassinate targets. The assassinations in Unity recapture the spirit of the first game by giving you a true sandbox that allows you to kill targets anyway you can imagine. The co-op multiplayer was a nice addition, yet Ubisoft seems to be abandoning it in Syndicate, it was a nice way to switch things up in Unity. There are some really bad parts of the game: Unity is marred by Ubisoft locking much of it’s content away in the companion app and Uplay. It feels like every other chest the player tries to open in Paris is locked unless you sink hours into it’s lackluster companion app. Ubisoft has a really fun game in Unity, but it kept forcing me to stop playing to look at my phone. Despite its frustrating moments, Unity is a beautiful and fluid game when it gets out of its own way. Assassin’s Creed III had lofty expectations to meet when it came out in 2012. It was the culmination of a modern day storyline that had been in the works since the first game. It came directly after the Ezio trilogy, three great games with what many view as the best protagonist in the series. On top of that it had a massive hype campaign that convinced everyone that this was going to be the best game ever! It wasn’t and to many the game was a disappointment. The protagonist, Connor, was a bit of a drag and the game didn’t even start with you playing as him. At times Connor felt very disconnected from the historical events of the game; an assumption of ACIII was that it was going to showcase the American Revolution in a big way. ACIII didn’t conclude the series in a great way and the game had some control issues that held it back from the game it wanted to be. Looking past all the expectations and disappointment is a good game that added a lot to the series. The setting was very well done, colonial America was felt authentic and the weather effects were good. Even though the game lacked the huge buildings of Renaissance Italy, it gave Connor the ability to climb and freerun through trees. It pushed the series from its urban roots to the wilderness and the game felt very comfortable there. Hunting was added and stalking animals and templars through the bushes worked well. Sailing was one of the best features of this game and it was for the most part entirely optional. The modern day sections finally let the Desmond be an assassin and we’re extremely gratifying. The ending was a let down as it wasn’t the conclusion we were promised, but the game was solid up to that point and a good addition to the series. Assassin’s Creed II was a game-changer that cemented the series core mechanics and popularity. To many the first game was disappointing, it was a good game, but didn’t live up to the lofty expectations most had for it. It’s sequel not only lived up to the hype, but surpassed it in many ways. Set in Renaissance Italy, the game stared the charming Ezio as he took down the Templar order ending with a fist fight against the Pope himself. Sounds ridiculous and in many ways this game was. It shrugged off much of the seriousness of its predecessor in favor of a game that embodied freedom and fun.. The protagonist, Ezio, is among the series best, and the supporting charters are all memorable in their own right. The plot is one of revenge and growth that features great voice actors and writing. The gameplay was sped up freerunning feels incredible. The action-oriented combat was beefed up and by the end of the game Ezio feels like a powerhouse that can plow through any number of guards. Ezio’s tools and weapons are far greater than that of his predecessor and the game now features hammers, maces, and axes. Italy is the star of the game as much as Ezio is. All of the cities in II are well done, and Venice is one of the highlights of the series. Exploring it’s canals in the game will forever be imprinted in my memories. Assassin’s Creed II is wonderful showcase for what the series does right and a great game to back to or experience for the first time. 2010’s Brotherhood was a surprise hit: coming out only a year after Assassin’s Creed II many were skeptical about the quick turnaround for the game. What Ubisoft delivered was a game that built on the gameplay of II in a fantastic way. Ezio returns, a little older but not any slower, and the game charges you with rebuilding the Assassins’ presence in Rome, a city left out of two for the most part. 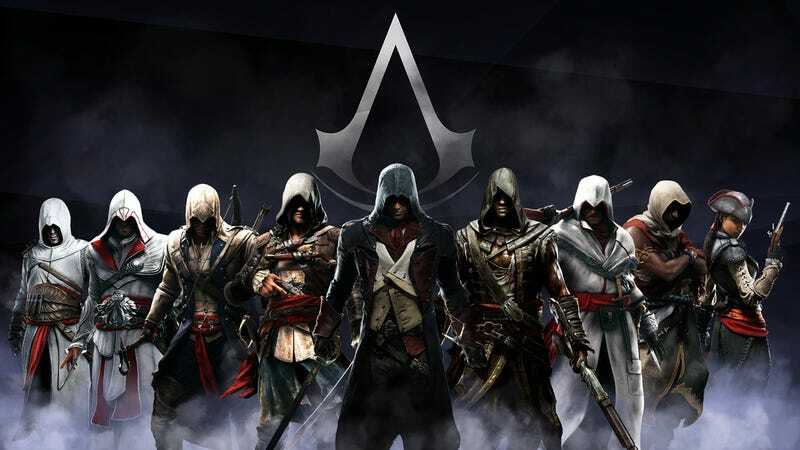 The player and Ezio now have access to a large team of Assassins that do their bidding. You could order them to kill, pickpocket, and fight for you. These allies added another degree of strategy to the gameplay and leveling them up was addictive. You watched them rise from a novice to a master assassin and felt a sense of pride as your brotherhood grew. The game takes place entirely in the city of Rome. It is wonderfully realized in game and features some of the best traversal in the series. For the first time Ezio can ride a horse everywhere in game to assist the player getting around the huge city. Brotherhood is one of the best games in the series and the best out of the Ezio trilogy, if you overlooked it in 2010 go back and play it. series. The sailing mechanics are back from ACIII but are pushed to the forefront of this game. Instead of having an upgradable town or homestead like in other games your hub is the Jackdaw, a pirate ship you can upgrade and sail to your hearts content. The Caribbean economy feels alive as you can raid and trade rum, sugar, and other goods for gold. The combat is noticeably less gory than in other instalments adding to the swashbuckling nature of the game; it’s fun and cinematic as Edward, the protagonist, swings his two swords with six pistols strapped to him jumping from ship to ship in search of enemy captains. The story of the Assassins and Templars is present in this game, but it never really jumps to the limelight in large part because Edward is the most selfish of all the Assassins in the series. He’s a pirate first and he will sail, raid, and kill to his heart’s content. If he helps the Assassins along the way that is cool, but it is never on the top of his priorities, and it won’t be on yours while you play Black Flag. Black Flag is all about fun and freedom and that is when the series is at its best I think. You never feel chained down or like you have to do anything in Black Flag, you go where your heart and the wind takes you and it’s a blast. Assassin’s Creed IV: Black Flag is my favorite game of the series because it is simply the most fun. Drink up me hearties YO HO!